sandpaper and silly putty: a home for our books! a home for our books! I'm a total bookworm and I couldn't be happier that Carson seems to love his books just as much as I do. He's already accumulated quite the literary collection (which was creating a constant mess in his bedroom) so we really needed somewhere to store all the stories. Here's where his new bookcase comes in. 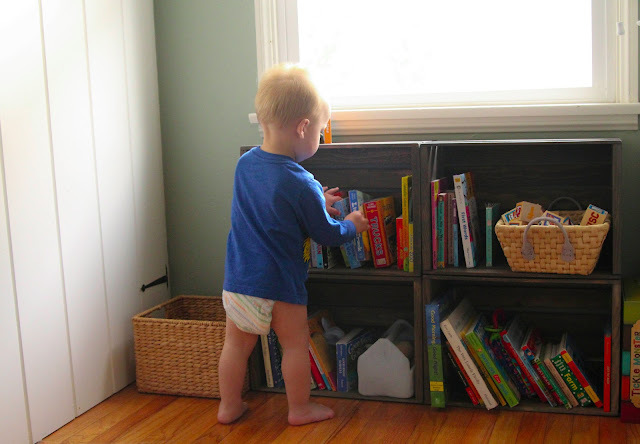 He's even learning to put the books back on the shelf all by himself! 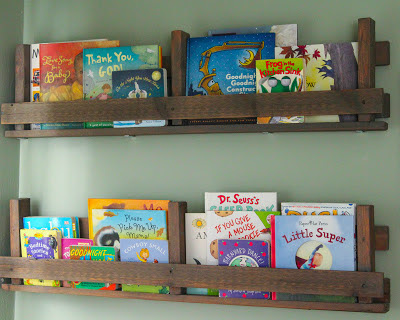 This bookcase was so simple to make. I already had a couple of Michael's wooden crates in the garage so I bought a couple more. I gave them a quick sanding and stained them with Minwax Classic Gray stain. Once the gray stain was dry, I screwed the four crates together to create the bookcase. I wanted a slightly darker color so I rubbed on a little English Chestnut stain to darken the color. Here's the plain gray next to the gray with chestnut. Here's the finished product all filled with books and keeping his room just a little more organized! He's picking out his favorite book, "Little Blue Truck" (it's one of my favorites too). If you have/know a little one and you haven't read this one, buy it and treat yourself to a good read (or in our case, hundreds of good reads). The new bookshelf matches quite nicely with the book display shelves that I made from an old pallet. These turned out so well...nice height for the little guy and yet plenty of room to keep his books easily accessible.